7010 ⊙ 573Uu 30 Pfg. Welfare 1968 with sensational variety \"at the bottom unperforated\" with printing number 1, fresh colors and neat cancelled the only us known copy and with the printing number absolutely an unique! In the Michel special catalogue up to now unknown. Photo expertize Schlegel BPP. 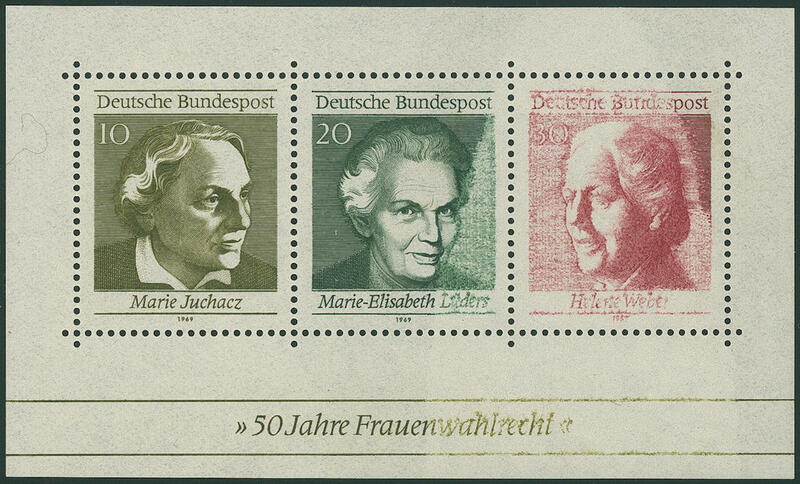 7011 Bl.5 Women's suffrage souvenir sheet 1969 with strong reduced paint application by the denomination value 20 Pfg. 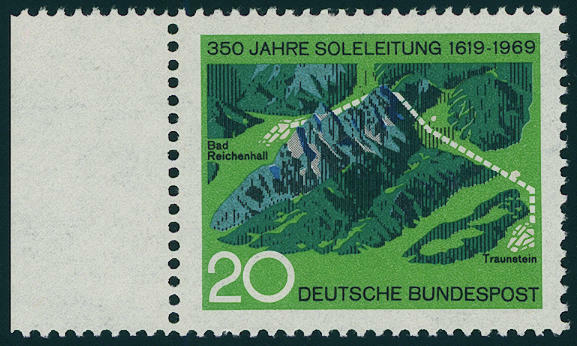 And 30 Pfg., as well at the inscription in the lower margin, in perfect condition mint never hinged these variety emerged as a result of one cleaning the compression roll during of the printing process. Very decorative and rare! 7012 Bl.5Abart Women's suffrage souvenir sheet 1969 with spectacular missing print at the 10 Pfg., originated through a sheet fold during of the printing process, in perfect condition mint never hinged such varieties are from this period very rare, because the controls in the Federal Printing Office very stringent samples. Photo expertize \"the quality is perfect\" Andrew Schlegel BPP. 7013 602F 20 Pfg. Brine pipeline 1969 with extraordinarily rare variety \"colours dark rose red and cyan blue missing\", fresh colors and very well perforated from left margin of sheet, in perfect condition mint never hinged, without any signs. From of this variety are only a few copies became known. Due to missing offers also in the Michel special catalogue only noted without price! 7014 603I 30 Pfg. 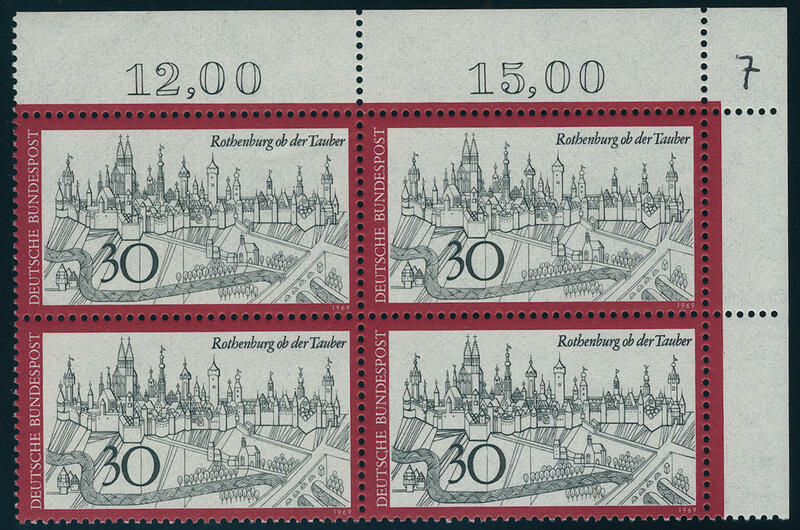 Rothenburg with variety \"double stamps image contours\" in the corner margin block of four top right with normal stamps se-tenant, in perfect condition mint never hinged, expertized Schlegel BPP. Michel 200,- €. 7015 608Ur 20 Pfg. 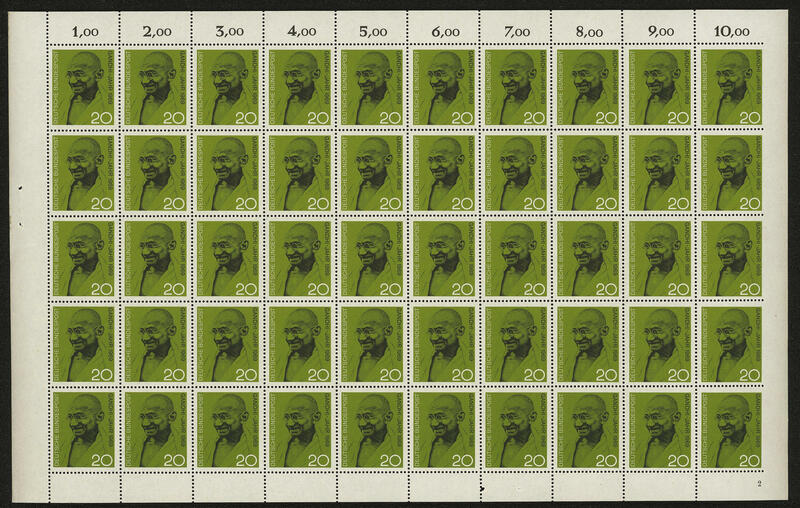 Gandhi 1969 in the complete original sheet with printing number 2. 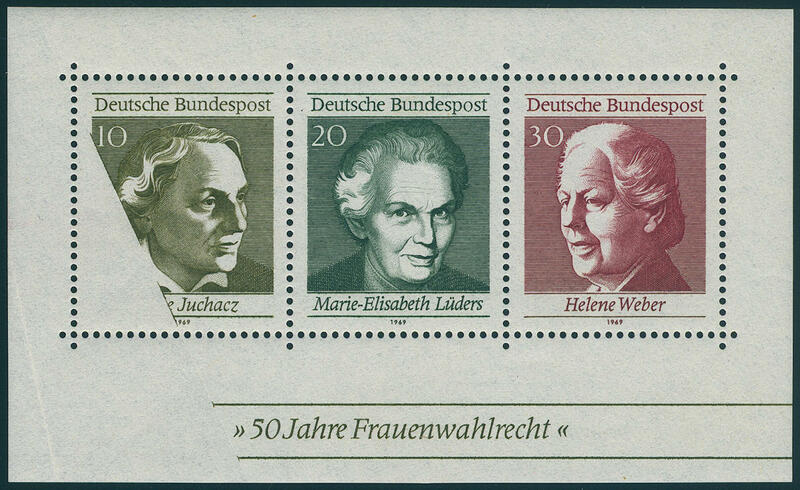 As well the five right stamps with variety \"right unperforated\". 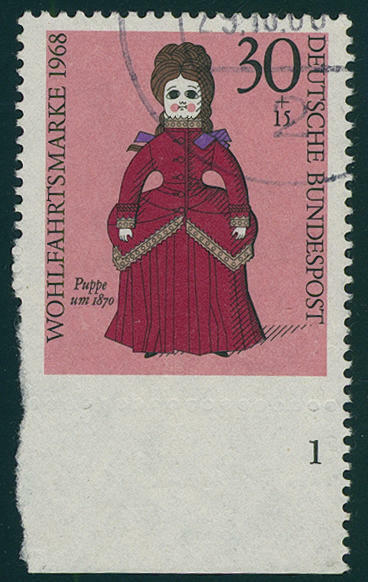 A very decorative and extremely scarce unit! Photo expertize \"the condition is perfect\" Schlegel BPP. 7016 XII 10 Pfg. 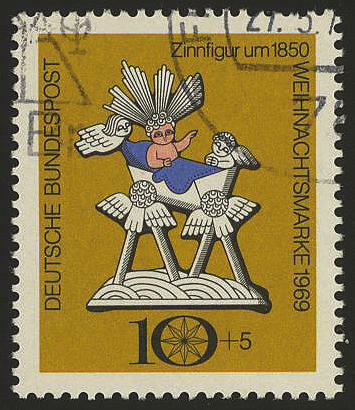 Christmas 1969, the very scarce not issued stamp \"WEIHNACHTSKIND with chubby\", with hand stamp \"sample\", fresh colors and very well perforated, in perfect condition mint never hinged, expertized Schlegel BPP. 7017 ⊙ 610F 10 Pfg. 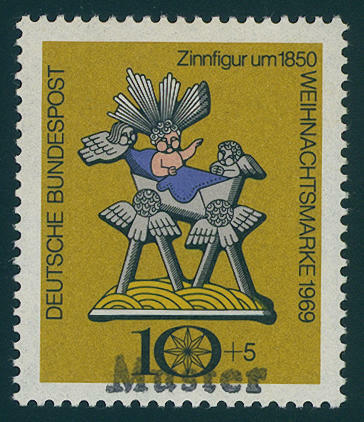 Christmas 1969 with extremely rare variety \"colours reddish yellow (straw) and grey (crÃ¨che, angel and Halo) missing\", above two perforation shortened, as far as neat cancelled one of the rarest varieties of the Federal Republic, of the only a few copies became known are. By Michel catalogue due to missing offers also only noted without price! Photo expertize Hans-Dieter Schlegel BPP. 7018 752Abart 40 Pfg. 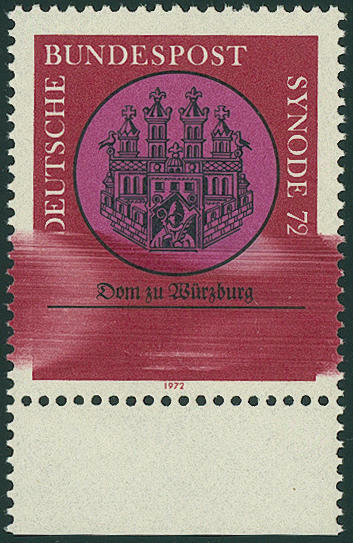 Convocation the Catholic bishoprics Würzburg 1972 with extremely strong blurred printing, through it \"without numeral of value\", in perfect condition mint never hinged very decorative and rare! 7019 780Ul 40 Pfg. 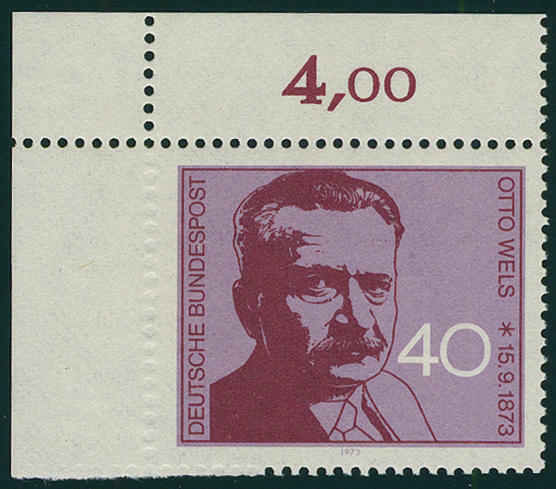 Otto wels catfish 1973, left upper corner of the sheet with spectacular variety \"left unperforated\", fresh colors, unfolded and in perfect condition mint never hinged this is by our knowledge the only known copy thus one of the great varieties rarities of the Federal Republic! In the Michel special catalogue up to now unknown. Photo expertize \"the condition is perfect\" Hans-Dieter Schlegel BPP. 7020 795I 40 Pfg. 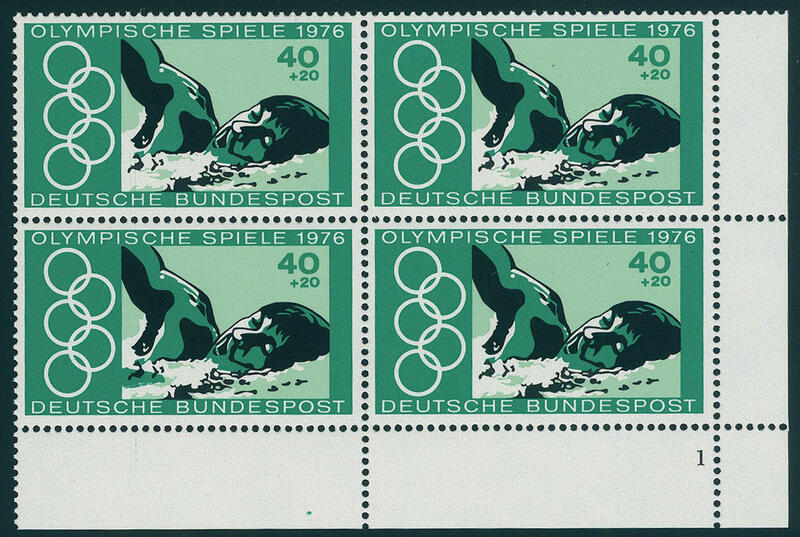 Thomas from Aquin 1974 in the horizontal pair, right stamp with very rare variety \"inscription German in part missing\". These variety came on field 7 in a tiny part of issue before. By Michel undervalued! 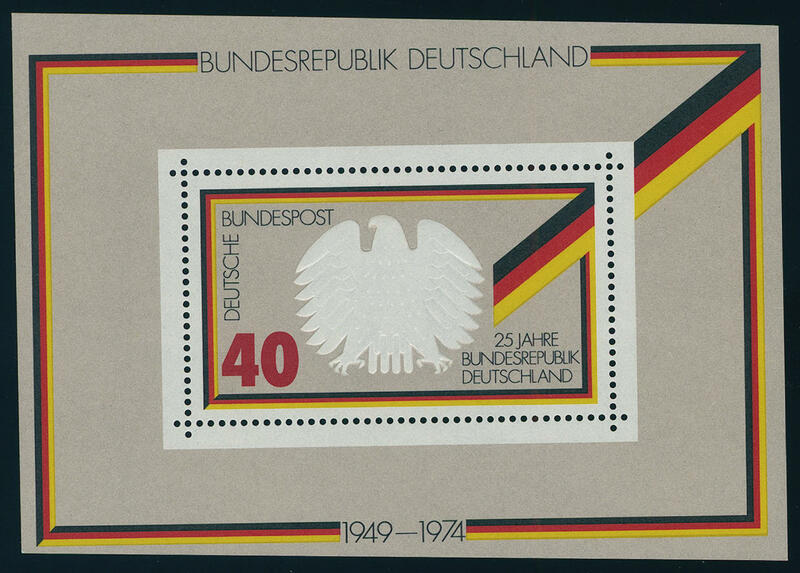 7021 Bl.10Abart 25 years Federal Republic souvenir sheet 1974 with very distinctive bias cut, in perfect condition mint never hinged from of this issue a very scarce variety! 7022 809FII 40 Pfg. Klopstock 1974 in rare variety \"signature over numeral of value semi-circular missing\", in perfect condition mint never hinged there are only few sheet with of this variety have become known. Possibly is a withdrawn first issue, of the a few sheet in circulation came. Photo expertize \"the condition is perfect\" Hans-Dieter Schlegel BPP. 7023 812F 40 Pfg. 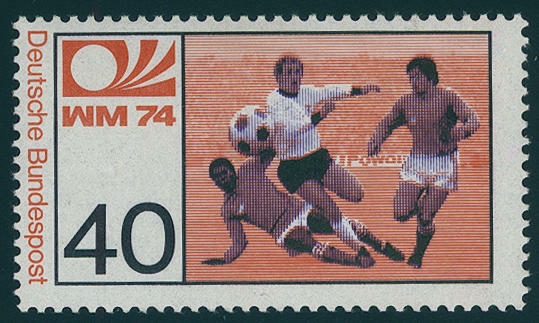 Soccer World championship 1974 with rare variety \"colour yellow (background) missing\", fresh colors and very well perforated, in perfect condition mint never hinged photo expertize \"perfect quality\" Schlegel BPP. 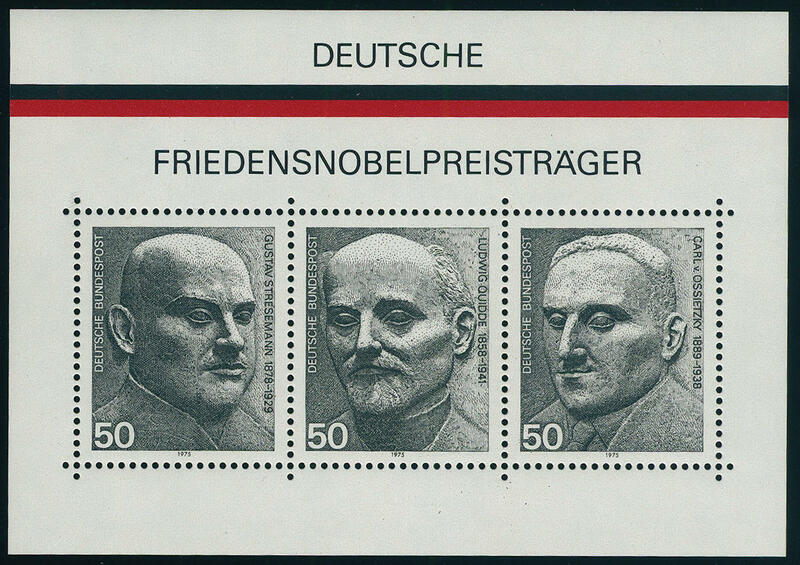 7025 Bl.11F Nobel peace laureate souvenir sheet 1975 with variety \"colour GOLD missing\", fresh colors and in full original size, in perfect condition mint never hinged, photo expertize \"the condition is perfect\" Schlegel BPP. 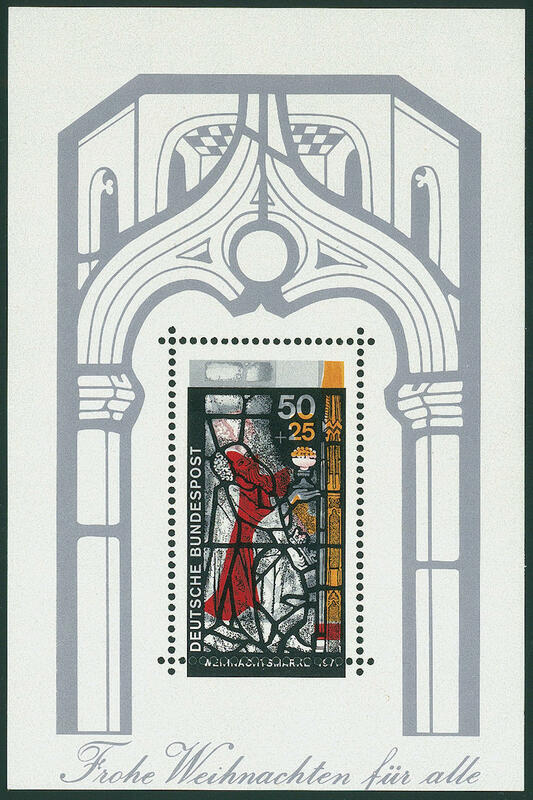 7028 Bl.15 Christmas souvenir sheet 1977 distinctive damaged in cutting and with additional extreme moved printings, in perfect condition mint never hinged a very decorative and in this kind extreme scarce variety! 7029 ⊙ 980/81U 50 Pfg. - 40 Pfg. 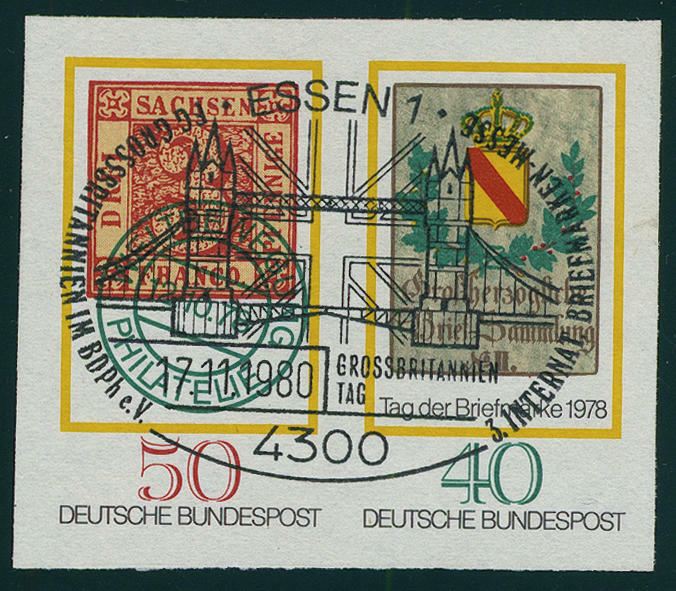 Day of the Postage Stamp 1978, horizontal pair of se-tenants with wide margins unperforated with centered special cancellation \"ESSEN 17.11.80. \". 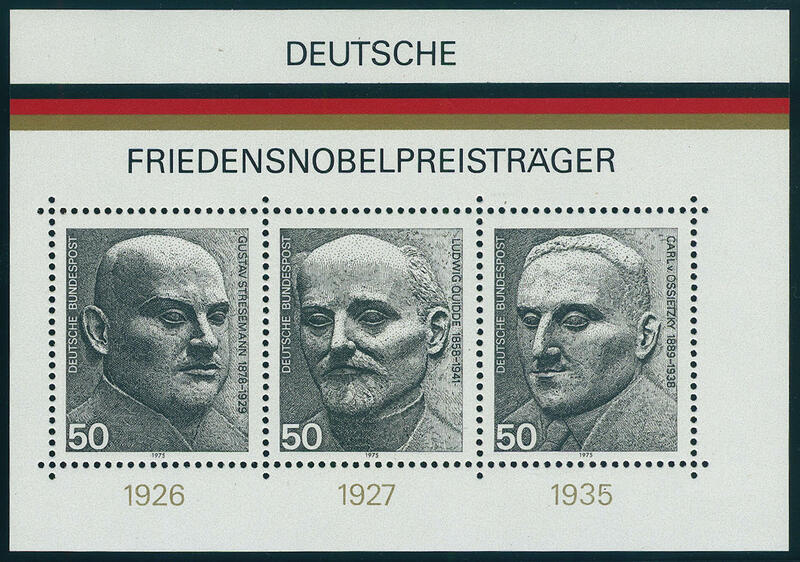 Already the unperforated normal stamps are by Michel catalogue only due to missing offers unpriced listed. The unperforated se-tenant is there unknown. A Federal Republic rarity! Photo expertize \"the quality is perfect\" Andrew Schlegel BPP. 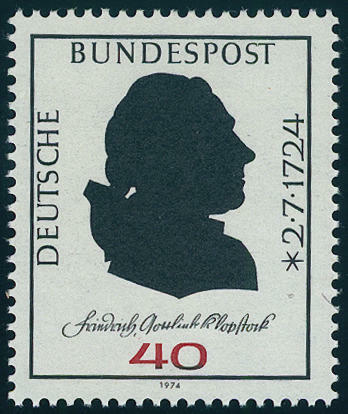 7030 1000/32 Year 1979 complete in the complete original sheet without Michel no. 1023 and 1028, in perfect condition mint never hinged Michel 1717,- €.